Hot off the painting table today. 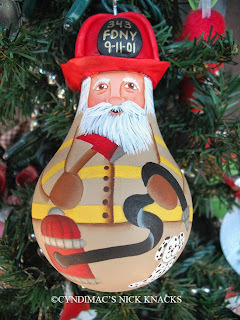 I have painted a fireman ornament that can be personalized to your needs. I wanted to paint mine in honor of those that lost their lives on 911. I am enjoying adding the clay for the hats on my newest ornaments. Nice addition, plus was the answer to my problem. $17.95 plus shipping in my Etsy shop.